It is worth recalling that the same triumphatory claim that the “Holocaust deniers” finally and once and for all had been “refuted” was heard in connection with Kola’s surveys at Belzec and Sobibór, which in reality turned out to refute the official version of events relating to these two camps. “Interviewer: What technology have you used to investigate the site? Sturdy Colls: I used a number of non-invasive techniques at Treblinka and what this means is, as you quite rightly pointed out, the ground wasn’t disturbed due to Jewish burial law so the methods used didn’t involve any form of ground disturbance or excavation and this allowed us to investigate the historic and scientific potential of Treblinka but obviously it was very important that we recognised its religious and commemorative significance as well. So the techniques that were used, there was a process of archival research which involved looking at documentary records, revisiting historical data if you like, looking at known data and assessing it with an archaeological eye, so looking for information about the landscape. Then there was a process of looking for aerial photographs of the site, any ground based photography, accounts by the witnesses, plans that had been created, etc, to build up a database of information so that when I did do the survey all of that could be corroborated against my results. So in the field this involved field walking, so assessing the landscape, topographic survey which used advanced GPS and total station surveying to demarcate features on a plan of the site allowed us to record micro-topographic change which may be indicative of buried features. And also to assess the visibility of other features such as a number of artefacts that were actually identified in quite a remote part of the site. Then moving on from that to look below the ground I used a number of geophysical techniques, so quite often mentioned is ground penetrating radar and this was one of the methods used but this was also corroborated with other methods that detect other physical properties in the soil. So I also used resistance survey and an extension of that which allows 3D imaging of buried remains as well, to ensure that all of the properties of the buried remains could be characterised accurately. Interviewer: And what have you discovered? Sturdy Colls: Well the survey results when corroborated with historical information have indicated that there are a number of surviving building foundations at Treblinka just below the surface and also a considerable amount of obviously structural debris which the Nazis would have been simply unable to have removed from the site, and this supports accounts written by post-war investigators which commented upon the visibility of artefactual remains, structural remains, at the camp. We’ve also identified a number of pits at the site. Again, all these pits have been mapped and corroborated with witness plans and this is indicative of a number of probable graves at the site. It is recognised as part of the survey that the history of Treblinka didn’t end with its abandonment by the Nazis. Issues such as post-war looting and the construction of the memorial itself and a number of other forms of landscape change that have taken place at the site, you know, could confuse interpretation so it was essential that all of these were considered when the results from the geophysical survey in particular were being assessed. So then all of this data was married up with historical information so we seem to have a situation here where it’s been commonly believed that all of the victims at Treblinka were cremated, they were destroyed without trace, however, the research has revealed a much more complex picture of the disposal patterns used by the Nazis. Looking at it from an offender profiling perspective, so a slightly more forensic point of view, the Nazis worked on, as do most offenders, this principle of least effort where they would actually have a burial method that very much matched the nature of their victims or their locations within the camp and there are a number of photographs and physical evidence that we observed on the ground at Treblinka that demonstrates that these bodies were not reduced to ash, that some survive as mass graves in the truest sense and that also the ashes of the victims were redeposited into the pits that they were originally exhumed from upon Himmler’s order in 1943. Also with the topographic survey we’ve demonstrated that the camp as it’s marked currently on the ground by the modern memorial was actually much larger, that the boundaries of the camp should have been 50 metres further north and this has a knock-on effect for a number of structures within the camp itself. So we can examine it from a spatial point of view and look at all of these features in relation to each other and hopefully eventually start to build up a more detailed map of the camp as it existed during its operation. Interviewer: So you’ve now presented your findings to the authorities responsible for the memorial at Treblinka. Does this conclude investigations at the Treblinka site or is it sort of an ongoing project? “Caroline Sturdy Colls: All the history books states that Treblinka was destroyed by the Nazis, in summary, the survey demonstrated that this simply isn’t the case. I have identified a number of buried [sic] pits using geophysical techniques. These are considerable. One in particular is 26 meters by 17 meters. Sturdy Colls: It is huge. We are talking about a considerable number of bodies [which] could have been contained within pits of that size. Charles: That could have contained hundreds, perhaps thousands of bodies, we don’t know deep it is, or do you know how deep it is? Sturdy Colls: Unfortunately no. The survey technology does not allow us to go to certain depths. I know that it is over 4 meters, that was the extent of this [inaudible]. It’s a considerable pit. Charles: There are quite a few pits that you have discovered? Sturdy Colls: Absolutely, there were a number of pits, in particular to the rear of what of what is now the current memorial, five that are actually in a row, again of a considerable size, in an area where witnesses state this was the main body disposal area, this is behind the gas chambers, it was where the majority of victims who were sent there were then subsequently buried, and later where the cremative remains of the victims were also placed. Charles: It’s not just pits that you found, there’s also what look like buildings. “The existence of mass graves was known about from witness testimony, but the failure to provide persuasive physical evidence led some to question whether it could really be true that hundreds of thousands of Jews were killed here. Although they lasted only a few days, those post-war investigations [in 1945-1946] remained the most complete studies of the camp until I began my work at Treblinka in 2010. Some may be the result of post-war looting, prompted by myths of buried Jewish gold, but several larger pits were recorded in areas suggested by witnesses as the locations of mass graves and cremation sites. One is 26m long, 17m wide and at least four metres deep, with a ramp at the west end and a vertical edge to the east. Another five pits of varying sizes and also at least this deep are located nearby. Given their size and location, there is a strong case for arguing that they represent burial areas. As well as the pits, the survey has located features that appear to be structural, and two of these are likely to be the remains of the gas chambers. Even more importantly, this article is illustrated with two composite maps on which the outlines of the findings made by Sturdy Colls have been superimposed on a modern-day aerial photograph of the former camp site and a 1944 aerial photograph of the same area respectively. In the figure below I have placed these two composite maps side by side, moved the main legend and the scale and slightly increased the picture size in order to allow for easier comparison of scale. On the map to the left I have also arbitrarily numbered the “probable burial/cremation pits” from 1 to 10 (click on the picture to view it in full size). 1) The pit which Sturdy Colls mentions “in particular” and which is stated to have a surface area of “26 meters by 17 meters”, that is a total of 442 square meters, is, judging by the dimensions, most likely identical with the rather irregular pit #3, located some 25 m south of the large cenotaph. This is clearly the largest in surface of the 10 pits identified. 2) As far as the surface area is concerned, 2 of the 33 mass graves identified by Andrzej Kola at Belzec (pits #1 and 27) were larger (with 480 and 540 square meters respectively), whereas 2 more (#7 and 14) were almost of the same size (364.5 and 370 square meters respectively). Of the 6 burial pits identified by Kola at Sobibór 2 (pit #2 and 4) were larger or even significantly larger (with surface areas of 500 and 1,575 square meters respectively), whereas 2 other graves were nearly of the same surface size (pits #1 and 6, with 400 and 375 square meters respectively). Yet whereas at Belzec some 435,000 and at Sobibór some 80,000 corpses are alleged to have been interred, the number of uncremated bodies buried at Treblinka is supposed to have amounted to at least some 700,000. Would it then not make sense for the Germans to use mass graves of a larger size at Treblinka than at the other two Reinhardt camps? The burial pits thus measured 1,500 square meters according to the witness Rajchman and maybe as much as (1,500 x 12 =) 18,000 cubic meters in volume! How come that the largest of the pits discovered by Sturdy Colls corresponds to less than one third of the surface size claimed by Rajchman and to one fourth of the surface area claimed by Rosenberg? 4) It is indeed unfortunate that the top modern equipment used by Study-Colls for some reason or other was not able to detect depths exceeding 4 meters. Perhaps it would have been wise of her to dispense of some of the piety with regards to “Jewish burial laws” and utilize probe drillings to measure the depth of the pits, as was done by Kola at both Belzec and Sobibór. Of the pits identified by Kola in these two camps, the deepest pit (#3 at Sobibór) measured 5.80 m, whereas the depth of the remaining pits averaged some 4 m.
Generously assuming Rosenberg’s estimate of 6 meters (Rajchman’s estimate of some 12 meters can be safely dismissed as an exaggeration), and even more generously assuming (for the sake of argument) 6 meters to be the effective depth, with the pit walls being vertical instead of sloping (an obviously unrealistic assumption, which is moreover contradicted by Sturdy Colls statement that this pit had a “ramp” at the west end and a “vertical edge to the east”, implying that three out of four side walls were oblique – but again, for the sake of argument…) pit #3 would have a volume of (26 x 17 x 6 =) 2,652 cubic meters. Assuming an average capacity of 8 corpses per cubic meters, this means that the pit in question could have contained in total (2,652 x 8 =) 21,216 corpses. Since the so-called Höfle document from an exterminationist viewpoint shows that nearly 713,555 were murdered at Treblinka up until the end of 1942 – in reality this document only proves that this number of Jews was deported to the camp up until that time – and since virtually all sources maintain that non-experimental cremations on a significant scale did not commence at Treblinka until 1943, at least 700,000 corpses would have had to have been interred in the camp, necessitating no less than (700,000 / 21,216 =) 33 pits of the same size as pit #3, with a total surface area of 14,586 square meter, or nearly 1.5 hectares. Needless to say the mass graves would have had to be separated by soil walls of considerable thickness, thereby increasing the surface area required by the graves. Above: Montage of the 10 identified pits placed within a square 100 x 100 meters. Relative dimensions have been kept unchanged from the maps produced by Caroline Sturdy Colls. 5) Pits #1 and 2, which together appear to have a surface area of some 600-700 square meters, are located in the western part of the camp site, near the torn-up railroad sidespur, clearly outside of the “death camp proper”. These may be identical with the mass graves mentioned by the witness Abraham Kszepicki, in which the bodies of Jews who had died en route to the camp were buried during the first months of operation. 6) The four pits #5-8 are placed in a (not very straight) row. Sturdy Colls states in the radio documentary that there are “five” pits of “considerable size” “in a row” and in the area which witnesses state “was the main body disposal area, (…) behind the gas chambers”. Either Sturdy Colls mistakenly said five when she meant four, or it may be that one of the pits, perhaps #6, with its “neck” in the middle, is counted by her as two separate pits. Regardless of which, it is clear that the pits #5-8 cover a surface area which corresponds to roughly 175-200 % that of #3, that is, somewhere in the range of 750-900 square meters. 7) Altogether, pits #3-10 as mapped by Sturdy Colls cover a surface hardly exceeding 1,800 square meters. If again, for the sake of argument, we assume the no doubt overly generous average effective depth of 6 meters with vertical pit walls – and once more I want to remind my readers that the pits identified at Belzec and Sobibór averaged some 4 m in depth – this would mean that the “probable burial/cremation pits” in the “death camp proper”/”upper camp”/”camp 2”  had a total volume of some (1,800 x 6 =) 10,800 cubic meters. The pits at Belzec as identified by Kola have a total estimated volume of 21,310 cubic meters, whereas those at Sobibór have a total estimated volume of 14,718.75 cubic meters. The no doubt greatly exaggerated estimate of 10,800 cubic meters could have contained at most some (10,800 x 8 =) 86,400 corpses (assuming instead a more realistic average effective depth of 5 m this figure would change to 72,000 – and this still disregards the likely enlargement of the original grave volumes due to clandestine diggings and other causes). According to Yitzhak Arad some 312,500 Jews were murdered in Treblinka merely “during the first five weeks of the killing operation”. According to the files of the Jewish Council in Warsaw, 251,545 Jews from the ghetto in that city were deported to Treblinka between 22 July 1942 and 12 September 1942. And as already mentioned, the Höfle document states that 713,555 were deported to Treblinka up until the end of 1942. Judging by the information revealed, only a small fraction of this enormous number of people could have been buried in the identified “probable burial/cremation pits”, even taking into account the two pits in the reception camp, which could not have been used for any hypothetical “gas chamber” victims given the reported structure of the camp. 8 ) Sturdy Colls’s statement that “the failure to provide persuasive physical evidence [of mass graves] led some to question whether it could really be true that hundreds of thousands of Jews were killed here” implies that the presence of mass graves itself would be enough to refute the “deniers”. However, it is clear that mass graves of considerable size must have existed at Treblinka, even if it was in fact only a transit camp. Holocaust historian Dieter Pohl estimates that up to 5 % of the deportees to the Reinhardt camps perished en route due to suffocation, dehydration, crushing caused by panicking deportees etc. Considering that the reception of transports at Treblinka during the intense initial months of operation is claimed to have been grossly mismanaged by the first camp commandant, Dr. Irmfried Eberl (who, apparently because of this reason, was fired and replaced by Franz Stangl), leading to the delay of transports at way stations – and this in the summer heat of July and August – there is little reason to doubt that a certain number of Jews must haved died en route from Warsaw to Treblinka, but on the other hand the trip from Warsaw to Treblinka when following schedule lasted “only” 3 hours and 55 minutes, so that for this group of deportees (making up roughly one third of the total number of Treblinka deportees) the en route death ratio is unlikely to have reached that posited by Pohl. The en route death ratio for transports originating from more distant parts of Poland and from other German-controlled countries was likely higher than that for the Warsaw deportees due to the longer travel time required. Since somewhere between 750,000 and 800,000 Jews in total were deported to Treblinka during the camp’s period of operation (July 1942 – August 1943), it seems reasonable to assume that the number of Jews who perished en route to this camp amounted to somewhere in the low tens of thousands. Moreover, there are reasons to assume that a smaller percentage of the deportees were subjected to “euthanasia” due to contageous or mental diseases, or for being too weak for further transport. To this should be added a smaller number of deaths among the camp inmates caused by epidemics etc, as well as those killed by guards in connection with attempts at escape or uprisings. 9) The vague mention of a “more complex picture of the disposal patterns used by the Nazis” is interesting. Were uncremated corpses also detected by the survey, and if so, how many? 10) Sturdy Colls label the pits “probable burial/cremation pits”, indicating that one or more of the pits may have been used for cremations and not for interment (at Sobibór Kola identified such a pit with an area of 10 x 3 m and a depth of up to 90 cm). In this context the smaller, more rectangular pits #4 and 5 may be the most likely candidates. The dimensions of an identified cremation pit could give important hints about the actual cremation capacity at Treblinka. 11) It is noteworthy that none of the pits or structural remains are located under the stone/concrete covered memorial areas (cf. the map to the left, where these areas are visible as a bluish gray). Sturdy Colls’s statements does not mention whether or not she was able to map these area with her geophysics equipment. This issue, like many others, will have to await further clarification. The covered area inside the “death camp proper” appears to correspond to roughly 1 hectare. “Unfortunately, the aerial photography does not contain enough information to delineate the boundaries of the graves. The May  coverage is sufficient only for crudely identifying the places where deep disturbances in general are probable, but the exact boundaries cannot be established. The dimensions of 50 x 25 m for the pits are taken from Bay’s number one eyewitness, Yankiel Wiernik, and his 1944 publication A Year in Treblinka. Wiernik writes indeed that “The dimensions of each ditch were 50 by 25 by 10 meters” but this almost certainly refer to ditches located not in the “death camp proper”, but in the reception camp. The scene wherein Wiernik provides the abovementioned dimensions takes place on the second day after his arrival in the camp, and the following chapters imply that first visited the “death camp proper” or Camp II, as he calls it, only several days later. In the figure below I have placed Bay’s Figure 42 side by side with the Sturdy Colls composite map based on the 1944 air photo. The scales of the two maps have been harmonized. To Bay’s map I have also added the letters A and B to indicate the solid black outlines drawn by Bay to mark out the two alleged gas chamber buildings. Even considering Bay’s admittal that the positioning and size of his mass graves “is purely speculative” it is clear that his vision of what the “death camp proper” might have looked like differ considerably from the Sturdy Colls map. As for the locations of the two alleged gas chamber buildings, which Bay goes to painstaking length to identify, based on the aerial photos and witness statements, the 4 structures marked out by Sturdy Colls (in blue) and designated “probable location of gas chambers” are located some 100 m south of the sites pinpointed by Bay. The alignment of these structures is also rather different from that asserted by Bay. Together with the considerable difference in surface size between the mass graves posited by Bay and the pits identified by Sturdy Colls, this says something of the competence of Bay as well as the reliability of his star witness Wiernik. 13) As for the “probable location of gas chambers” we learn virtually nothing other than that Sturdy Colls has identified two brick structures. On the composite maps, however, four structures are marked out, of which the largest (near the eastern exit of the “Road to heaven”) is likely to be the one identified by Sturdy Colls as the “new gas chamber building”. The three other structures, two of which are relatively large, are located close to each other. One must suppose that one of the two larger structures has been identified by Sturdy Colls as the “old gas chamber building”. 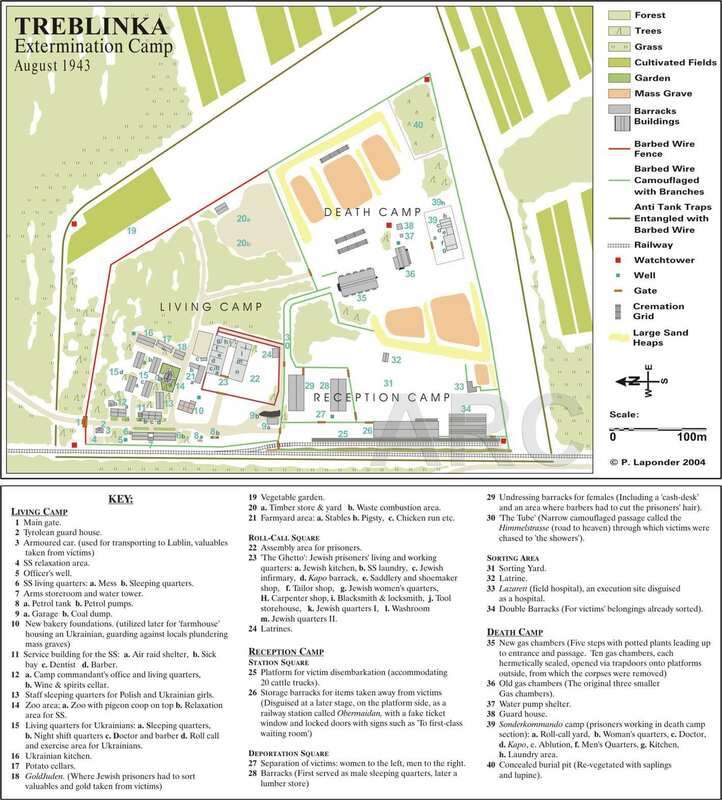 According to the most elaborate exterminationist effort to map Treblinka based on aerial photos and eyewitness testimony (and in this case one of the ground photos from the Kurt Franz “Schoene Zeiten” album interpreted by Bay and others as taken inside the “death camp proper”), the 2004 map of Peter Laponder, the only structures located adjacent to the “old gas chamber building” were a water pump shelter, a tiny guardhouse, and a watchtower. Yet on the composite map we have two larger structures next to each other. We will have to wait and see if the geophysical survey has revealed anything about the layout of these structures. If that is not the case, we can only hope that Sturdy Colls soon returns to the camp site to excavate the detected structural remains. All in all, the information revealed by these interviews about the findings of the 2011 geophysical survey at Treblinka provides us with more questions than answers. We can only wait and hope that a preliminary report on the research results is not too long in coming. One thing is sure, however, namely that little indicates that the findings of Caroline Sturdy Colls have actually “proven Holocaust deniers wrong” with regard to Treblinka. On the contrary: the information revealed seems to hint that the findings of Caroline Sturdy Colls may well spell the doom of the official historiography on Treblinka. “Treblinka: Revealing the hidden graves of the Holocaust”, http://www.bbc.co.uk/news/magazine-16657363 The article carries a heading which concludes with the words “…writes forensic archaeologist Caroline Sturdy Colls” giving the clear impression that what follows is a piece written directly by Sturdy Colls herself; on the other hand the article isn’t signed. Nevertheless it is clear that the contents of the article are derived from Sturdy Colls together with the composite maps. Cf. Carlo Mattogno, Belzec in Propaganda, Testimonies, Archeological Research, and History, Theses & Dissertations Press, Chicago 2004, p. 73. Cf. Jürgen Graf, Thomas Kues, Carlo Mattogno, Sobibór: Holocaust Propaganda and Reality, TBR Books 2010, p. 120. Cf. Jürgen Graf, Carlo Mattogno, Treblinka. Extermination Camp or Transit Camp?, Theses & Dissertations Press, Chicago 2004, p. 138. Chil Rajchman, Treblinka. A Survivor’s Memory 1942–1943, MacLehose Press, London 2011, p. 60. Yitzhak Arad, Belzec, Sobibor, Treblinka. The Operation Reinhard Death Camps, Indiana University Press, Bloomington and Indianapolis 1987, p. 85. C. Mattogno, Belzec…, op.cit., p. 73. J. Graf, T. Kues, C. Mattogno, Sobibór…, op.cit., p. 120. Y. Arad, Belzec, Sobibor, Treblinka, op.cit., p. 87. Dieter Pohl, “Massentötungen durch Giftgas im Rahmen der ‘Aktion Reinhardt’: Aufgaben der Forschung” in: Günter Morsch, Betrand Perz (eds. ), Neue Studien zu nationalsozialistischen Massentötungen durch Giftgas. Historische Bedeutung, technische Entwicklung, revisionistische Leugnung, Metropol, Berlin 2011, p. 194. Cf. Y. Arad, Belzec, Sobibor, Treblinka, op.cit., pp. 87-88; J. Graf, C. Mattogno, Treblinka. Extermination Camp or Transit Camp?, op.cit., p. 107. According to the English-language Wikipedia article on Ground Penetrating Radar (http://en.wikipedia.org/wiki/Ground-penetrating_radar) “Good penetration is also achieved in dry sandy soils or massive dry materials such as granite, limestone, and concrete where the depth of penetration could be up to 15 m”, implying that the concrete slabs of the memorial in themselves should pose little problem for a GPR survey. There may of course be other, unrevealed hindering factors.